Road trips make me giddy …and lighting a candle before I start my work in the political world helps me to feel more cozy. That’s what I’m doing right now. So I live in Beech Mountain now and it’s been in the lower teens as far as temperature goes for the last week. I moved and stacked a cord of wood last night in 25 degree weather and I’m leaving town today. Excited to go and sing with my dear friend on his newest album. I’ll be there for the weekend. It is going to be lovely embracing the musical spirit in someone else’s dreams and making them a reality. I love to harmonize with other voices. This is where my musical background comes to the forefront, singing in choirs fills my heart with gladness. Next I’m traveling home to Alamance County where I will be celebrating thanksgiving and visiting with all of my dear pals from Saxapahaw, NC. I am very much looking forward to Jazz night at the Eddy and host ing Trivia with a music theme. I hope that all my homie humans will be there and they can commiserate my leaving and staying gone while also celebrating my momentary return. I will also be purchasing a couple of jars of Saxapahaw Honey. That makes me happy. I will be staying with my grandparents during this visit, that also makes me very happy. I am so glad they are happy and healthy and I look forward to spending some quality time with them. On the 30th I will be taking the TRAIN to New York City. It’s an all day ride and I can’t express how excited I am about that. I love love love traveling by train. Once I was taking the train from Minneapolis to Chicago and it was glorious. I was sitting in the all glass car, playing guitar and singing for the people around me, making friends, and discussing politics when suddenly, there she was! The Julia Belle Swain! Shining in all her glory and oh how I wished that train would have slowed down so I could have stolen a better look at her. I stood up from my seat and exclaimed, “The Julia Belle Swain!” pointing out the window looking like a child who’s just seen the moon for the first time (maniacally and excitedly with bug eyes). Needless to say, everyone on that train was wondering what else was wrong with this woman they have to ride with for several more hours. When I get to NYC, I hope to see some dear friends and catch up with the city of a million smells. On the 1st, I’ve been invited to a gala in Brooklyn recognizing my executive director for her amazing dedication to the cause of getting money out of politics and advocating for fair elections. Joan Mandle is an amazing woman whom I admire very much. I have worked for her now for about 4 years and I hope to continue because I believe in the work that we do. Tuesday, I travel to Sarah Lawrence College to speak on a panel about student engagement, local civic participation and money in politics and then I am giving a training/workshop on lobbying in New York. It is very encouraging that my student at SLC has worked so hard and is very passionate about getting this event together. I must say however, that public speaking still makes me nervous. Singing, dancing, speaking, all of it gives me butterflies.. at least in the beginning. It’s because I care. That’s about it for now, safe holiday traveling for everyone and remember to think about and pray for those in need, and then actually DO something about it. Categories: Uncategorized | Tags: Alamance County, Alison Weiner, Anita Lorraine Kinney, art, Burlington, fair elections, gala, John Hartford, Julia Belle Swain, Mississippi River, morning, music, NY, recording, riverboats, Sarah Lawrence College, Saxapahaw, singer-songwriter, SXPHW, thanksgiving, The Eddy Pub, trains | Permalink. Come out and Support Live, Local Music! I’m debuting in Carrboro!! 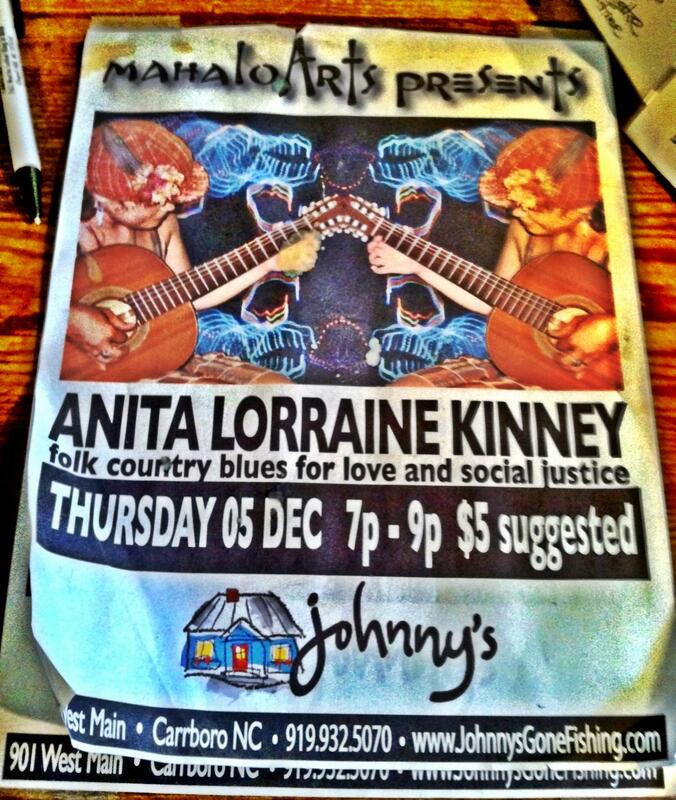 mahaloArts is very pleased to present Anita Lorraine Kinney aka SLAKFAC (sweet little anita kinney from alamance county) – a singer/songwriter/poet/musician and North Carolina native, currently residing in Saxapahaw. Her music comes from a folksy, country, and bluesy place in her heart and is driven by love and a passionate dedication to social justice. Come be delighted and informed! mahaloArts, in partnership with Johnny’s, offers an on-going series featuring local performing artists. The format for these two-hour events generally includes performance and storytelling by guest and host Alison Weiner, with one intermission. Categories: Uncategorized | Tags: Alison Weiner, Anita Lorraine Kinney, North Carolina native | Permalink. TuesDayNewsDay on Wednesday! Vol 2, Issue 7 ~ 2/20/19 Spring Equinox today!